Canadian consumers are being lied to. Maple Lodge Farms plasters its products and website with pastoral images of spacious landscapes and healthy, heritage chickens enjoying sunlight and grass. In reality, the chickens it slaughters were bred to grow so large, so quickly that they collapse under their own weight and die of heart attacks while still peeping like babies. They will virtually never have seen the light of day or felt grass beneath their feet before they are killed at just six weeks of age. Maple Lodge Farms claims to be committed to the "humane," "respectful" treatment of chickens. In reality, Maple Lodge is currently on probation for 20 animal cruelty convictions. In just one year following its convictions, it received 14 additional fines for animal cruelty offences - significantly more than any other company in Canada. And just last week, it was exposed for "torturing" chickens in its slaughter factory. Maple Lodge Farms repeatedly references its family-owned status, knowing that consumers believe family farms to be the opposite of factory farms. In reality, Maple Lodge is the epitome of profit-driven agribusiness, treating chickens like meat-production widgets in a food assembly line. In fact, Maple Lodge "Farms" operates no farms of its own. It's no wonder deceived consumers were outraged when video footage surfaced revealing that what Maple Lodge considers "humane and respectful," animal welfare experts consider "unconscionable," "inexcusable," and "abhorrent." Like most developed countries, Canada prohibits false and misleading advertising. That's why Animal Justice filed a legal complaint with federal law enforcement authorities, the first of its kind in Canada. Similar complaints in countries like the U.S., Australia and New Zealand have led to a crackdown on claims made by the agricultural industry, resulting in huge court fines and industry reform. 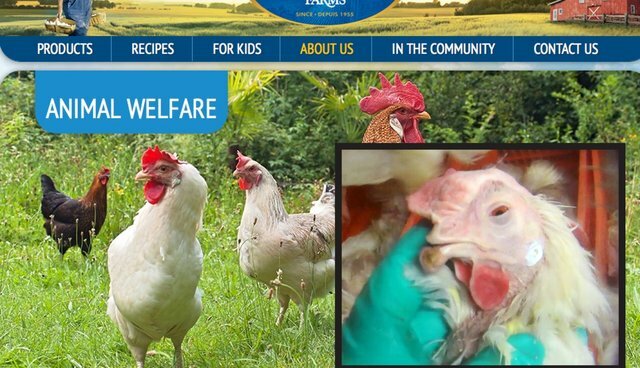 Maple Lodge profits by cutting corners on animal welfare and misleading consumers about it. Its false and misleading advertising practices dupe consumers into purchasing what they believe to be humanely produced products, when the evidence clearly establishes that these chickens have suffered egregiously. If you believe that agribusiness should be stopped from blatantly humane-washing its unconscionable animal cruelty practices, please sign the petition calling on federal authorities to act. And consider withdrawing your financial support of this cruel, dystopic industry altogether by making the only truly "humane" choice for chickens: leaving them off your plates.